A favorite among yoga professionals, Sága Yoga Blue Mandala Yoga Mat offers great balance of support and traction. Made from all-natural rubber, the cork yoga mat has a non-slip grip. 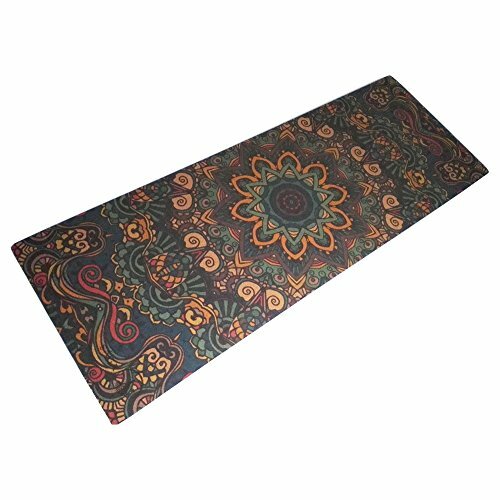 An eco-friendly choice, Saga Yoga Mat features spiritual and ritual symbolic designs of Mandala, which helps keep the yogi focused during various asana. The cork surface of the fitness mat prevents bacteria or moisture from getting absorbed into the mat. The soft cushioning of the yoga mat makes your sessions comfortable, especially for longer hours. The Saga Yoga Mandala Mat is easy to fold and carry. Why buy Sága Yoga Blue Mandala Cork Yoga Mat from us? Our range of cork yoga mat is known for its durability, quality and comfort. We are highly acknowledged as a leading manufacturer of high quality cork yoga mats. At Saga Yoga we completely understand that comfort cannot be compromised during yoga sessions and, that is why we offer a wide range of non-slip yoga mats, which have been specially designed for you to practice your postures. Quality and uniqueness of our products have resulted in huge and reputed clientele in a very short span of time. If you have any questions about this product by Sága Yoga, contact us by completing and submitting the form below. If you are looking for a specif part number, please include it with your message.